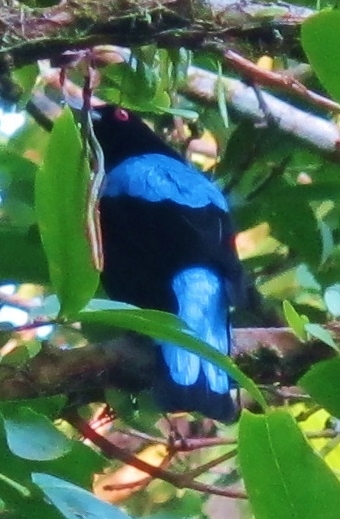 Asian Fairy Bluebird at the FRIM botanical gardens, July 18th. After our month in Indonesia, we spent several days in extremely civilised (and expensive!) Singapore. Luckily we were staying with friends, which kept the costs down somewhat. With just one free morning for birding, I elected to head to Rifle Range Road in the central catchment area, which on the map appeared to be within walking distance of our accommodation. It turned out to be over an hour’s brisk walk away, but with great views of Blue-crowned Hanging Parrot and Pied Imperial Pigeon along the way, I wasn’t complaining. Alongside Rifle Range Road is some excellent, intact tropical rainforest, in which the birds seemed more active and conspicuous than is usual for this kind of habitat. Highlights of a couple of hours wandering along the road included a stunning pair of Banded Woodpeckers, a Chestnut-bellied Malkoha, and a showy male Crimson Sunbird. Our next stop was Kuala Lumpur in Malaysia for a couple of nights. Our Singaporean friend had warned us of the potential for civil unrest and even a terrorist attack in central KL that weekend, and seeing as Jenna and I have both visited KL before, it was an easy decision for us to stay outside the center of the city. We visited the Batu Caves, which have to be one of the least impressive tourist attractions I have seen in Asia – horribly crowded, stiflingly hot, filthy dirty, infested with monkeys, and home to lots of shabby food stands where I contracted a healthy dose of food poisoning. The upside of the Batu Caves district is the Forest Research Institute of Malaysia (FRIM), a mere 25 minute walk from our hotel. I arrived at 7am and was very surprised to find runners, cyclists and even picnicking families already active in the park. It’s an impressive place, with open parkland and patches of mature forest providing easy birding opportunities, and it wasn’t too hard to escape the crowds. I lucked upon a fruiting tree beside the road, which produced some excellent sightings over a one-hour period including both Sooty and Gold-whiskered Barbets, Greater Green Leafbird and a beautiful male Asian Fairy Bluebird. Nearby, a Blue-eared Kingfisher at a small pool was a useful year list addition, a bird I’ve seldom seen in SE Asia despite it being very widespread. Singapore and Malaysia Lifers: Banded Woodpecker, Blue-crowned Hanging Parrot, Olive-winged Bulbul, Gold-whiskered Barbet, Sooty Barbet, Spectacled Spiderhunter, Spectacled Bulbul. Singapore and Malaysia 2015 Year Ticks: Pied Imperial Pigeon, Chestnut-bellied Malkoha, Red-eyed Bulbul, Grey-breasted Spiderhunter, Blue-eared Kingfisher, Greater Green Leafbird, Orange-bellied Flowerpecker (total 814).